Some people are frustrated with a new trash pickup method in Hernando County after several missed pickups were reported this week, but the county says the new system will make pick-up better but will take time to fine tune. HERNANDO COUNTY, Fla. — Some people are frustrated with a new trash pickup method in Hernando County after several missed pickups were reported this week. The county says the new system will make pick-up better, but will take time to fine tune. "We still have smelly, nasty trash just sitting in here waiting to be picked up," said Phil Merrill about the full trash bin in front of his Spring Hill home. Anyone who lives in Hernando County knows that missed trash pickups have been an issue in the past. The county says Republic Service is trying to fix that by implementing a new automated system. The new trash pick-up method started this week. The blue trash bins are supposed to make pickup safer and more efficient. But Christine Arcidiacono says her garbage hasn’t been picked up all week. "Hopefully it’s not too much of an eyesore as people drive by and see my garbage out every day until it gets picked up," Arcidiacono said. 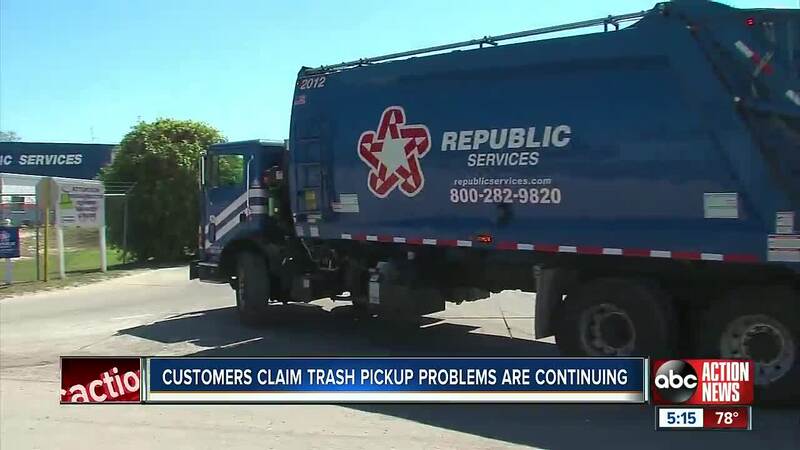 Republic Services sent out this automated message to customers addressing missed pickups: "Pickups may be delayed due to new routes and new equipment. In the event that you're not serviced on your regular pick-up day, please leave your items on the curb and you will be serviced the next pickup up day." Hernando County contracts Republic Services to pick up garbage for the county. Acting county administrator Jeff Rogers is asking customers for patience. "It is a major change and a major system role out," said Rogers. He says the new system will take time to fine tune as drivers learn new routes and are trained. He says people putting out trash bins the wrong way has also slowed the process. "In the long run it's going to be a great system for Hernando County to move forward," said Rogers. But the county wants anyone with missed pickups to report them on Hernando County’s website so they can keep track. "We will hold them accountable to ensure this system, as they promised us, is going to allow us the ability to provide a great level of services for our citizens and to minimize the number of misses," said Rogers.